That sounds pretty spectacular. I grew up with the Moosewood, too, (and with whole wheat sandwiches, which, like you, I thank my mother for now) but for some reason have never had the curried peanut soup. Your version looks like it might be dinner tonight. Thanks! If you do decide to try a Fluffernutter, there are a couple things to keep in mind. First, as a child they were delightful, but as an adult they are a sugar rush of epic proportion. Second, the best Fluffernutter, in my opinion, involves a contraption called a snackmaster. It is a sandwich maker that can be used for making grilled sandwiches, but the magic is that it seals the edges of the sandwich (in two triangular halves) so that the peanut butter and Fluff get all melty and gooey but don't leak out all over the place. (Chocolate and fluff would be good this way too. )Where Fluff really shines is in hot chocolate. That's the reason I keep a jar on hand. I just read about a similar soup in a book about pulses – just discovered that peanuts actually classify as pulses! I then bought a huge bag of peanuts at my local thai shop with the excuses that being pulses they must be good for you (I know, I'm not fooling even myself). But the recipe on the book does not give me confidence, yours does. By the way, as much as I love peanuts, I'm always amazed at how they are used in the US… Fluffernutter sandwich, oh my! I don't think I've ever tried marshmallow cream either, but I'm seriously so tempted. Your soup sounds much more interesting though, to my hopefully! more grown up tastes. I love that your recipes are always things I've never heard of. I had very similar experiences with seemingly esoteric fluffernutters as a kid. It was the same unfulfilled curiosity with which I encountered single-serve chip packs, chips ahoy, and those plasticky neon juice burst drinks. Kids, they only want what they can't have!I like to add a few teaspoons of cumin and mustard seeds to toast up when sauteeing the onions for peanut soup. Bit of texture really adds a great new dimension to it. I only last night took Enchanted Broccoli Forest off my shelf, wondering if I should give the book away. While I used Moosewood Cookbook a LOT, I got a used copy of EBF too late to be into its sort of recipes. I leafed through it last night and couldn't bear to give up on it yet! Your post is confirmation, and your recipe elaboration and inspiration. Can't wait to try this, maybe even this week. Like you, I was "deprived" of most processed foods as a kid, and remember it being quite the treat to eat at friends' houses whose parents kept the cupboards stocked with cookies and chips. As an adult, however, I'm immensely grateful- I see the number of people battling with obesity and diabetes and thank my lucky stars I never developed a real taste for those foods. I guess everyone reacts differently to that, though- I think my sister ended up seeing those foods as a "status symbol", and she buys lots of packaged and processed foods for her kids because she wants to give them what we didn't have. I remember the day Cindy Thompson showed up at school with a lunch of Oreos, wagon wheels, a Snickers bar and a thermos of chocolate milk. It was the next best thing to fluffernutter, and I was racked with envy. The idea of fluffernutter sandwiches on white bread seems way over the top for me, but I do adore (and recommend) fluffernutter on graham crackers, especially dipped in hot tea. The combination of softened graham cracker, sweet fluff, and salty peanut butter is delicious. My grandmother gave them to my mom as a special treat when she was sick, and that's when my mom would give them to me. I gave them to my own daughter as a special treat– but she hated them! The first time I tried peanuts in soup was when I posted about Sudanes shorba a few months ago. It was very good but turned out a little thick with the rice cooked in it. This looks wonderful and I like the idea of the cooked grain seved on the side. Mmm… this sounds great. We live in Dakar, Senegal, and love mafé. This adaptation looks delicious. Thanks for sharing it! Loved hearing about Karen!My parent's grew up on the Malabar coast. When they immigrated to the states, they brought all their Kerala recipes. Growing up in southern Illinois I too longed for fluffernutter. And I b-e-g-g-e-d for Swansons dinners. My pleas generally fell on deaf ears. As an adult, I realize what a gift it was to eat biriyan, idli, dosa, and other meals prepared from scratch. Melissa, thank you so much for the recipe links! You should definitely try the pineapple kale stew, it's amazing. I spent a month last year traveling around Senegal visiting a few friends who live there. One of the best things about the whole trip was eating mafé in the cheb shacks – basically, makeshift shacks composed of brightly colored fabric draped over tin roofs. You were served laaaarge portions of mafé by Cheb Mamas with their babies slung over their backs (I'm pretty sure that's not their actual title, just a moniker given by that strange expat parlance developed when you live abroad). Happily, I live on the edge of the Congolese/Senegalese neighborhood here in Brussels and can get mafé whenever I want. For some silly reason I never thought about making it myself! And voilà, here you go posting this. I think I found a new recipe to tuck away for later. What a delightful post. It reminded me of a child I envied at school too, we used to play out after school and she would always eat a jam sandwich in the street. Cheap white bread spread with margarine and a mixed fruit jam, which didn't really contain much fruit. I was so envious, I asked her to share and she told me to go and get one from from home and we could swap. I came back with one my mother had made, fresh homemade bread spread thickly with real butter and fruit conserve…. once swapped we were both in heaven!!! If my mother had ever found out she'd have been appauled! Aren't kids funny? Thank you ever so much for this. I love peanuts in all forms – coated in chocolate, in satay, on a sandwich, but think look like an exceptional way to use them. This I think, could be considered a soup of champions.I very much enjoy a peanut putter sandwich, or peanut butter on toast, but for me the joy of them is the saltiness, and I have them on savoury brown or seeded bread, so the very idea of putting marshmallow fluff on them is almost blasphemous to me! Tulip Fairy, your post brings back some memories..I used to swap my lunch-time sandwiches made with thick whole wheat/rye bread and cheese/tuna, celery, carrots, tomato AND lettuce AND mustard/gherkin relish with a guy who brought a plain white bread and cheese sandwich!!! The grass is always greener. lol. By strange coincidence, I just tried my first fluffernutter last week. Or something sort of like one, at least. I had never even heard of such a thing until I moved to New England, where they are supposedly quite the lunch box institution. Marshmallow fluff kind of scares me, but since I had homemade marshmallows to use up while still fresh, out of sheer curiosity I put a few on some whole-grain toast with some 100% peanut (yes, not even salt added) peanut butter. It was actually pretty delicious, if ersatz by the standards of the highly processed original, and I cannot help but recommend it. Not that I let my children see me eating it, mind. Besides, my oldest is starting school next year, and I see from the parents' handbook that both peanut products and sweets are forbidden in the lunch box. So much for THAT New England institution! How tempting – this sounds absolutely delicious, and the minute I have time to go peanut shopping I shall be giving this a whirl in my own kitchen. Your blog continues to be a source of real inspiration. Thank you again, Melissa. A couple of years ago I tried bringIng in a pot of soup (meatless) to the office on Lenten Fridays. Good offering I still try to remember. Brought a slight variation on this one in today. Big hit. Had some Kenyan spicing I got from Mercedi I used instead of the curry/cayanne. Had a bottle of Melissa's Naga Jolokia to dash in for those of us that like the taste of summer on cold wet Seattle days. It was wonderful – it was gone. Hi guys, just thought I'd let you know that you convinced me — last weekend I went out and bought my first ever jar of Marshmallow Fluff®. Funnily enough, on the back was a recipe (in German) for a fluffernutter, "the most popular sandwich in the USA"! Unfortunately the only kind of bread I had on hand was super grainy and dense rye bread, so quite a bit of my fluffernutter was probably lost in translation, but even so I was pleasantly surprised. In fact, I liked the combination of peanut butter and Fluff so much I started experimenting. So far the winner is PB and Fluff on a square of dark chocolate. Holy moly, dangerous stuff. Hello, I love your blog and pretty much tried out this recipe and it's amazing! Thank you for such an inspiring blog and amazing food. Fluffernutter sounds awful, it still amazes me what we love as children! This brings me right back to Ghana! I attended a cooking class in Takoradi in September and we made a soup just like this! It was paired with fufu, made of mashed cassava, which was a untasty separate story. Thank you for bringing back such beautiful memories for me! A fluffernutter is only good if you toast the bread ( like almost any kind), spread the P'butter, then spread a layer (I like a thin layer) of marshmallow fluff and then broil it while watching carefully. When it is brown like a toasted marshmallow, pull it out. TOASTED marshmallow of any kind is a great pair with chocolate and nuts. Nutella (chocolate and hazelnut spread) and fluff toasted on toasted bread is yummy too. I love everything with peanuts! 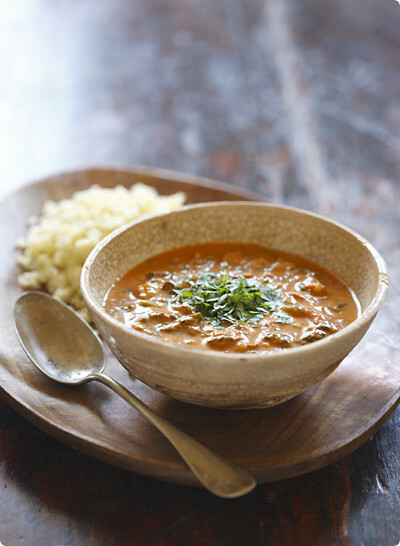 And this lovely soup reminds me of an African peanut stew with pork. I have to cook that again, and of course your soup. Great soup! Had been planning to make it for a while, today I finally went and got some coconut milk… Thank you for the recipe…Delicious! My mouth is watering at the thought of making this. I love anything with coconut and curry anyway.